I’m sure you’ve heard it before, but willpower is limited. That means, the more we use it during our day, the less we have for those difficult decisions come the evening time. There is so much evidence supporting this concept. And just a little piece of unrelated advice, if you have to go to hospital for an operation, go in the morning! Going to court? Get a morning session! Judgement, performance and patience all seems to wane in the afternoon. Worrying? Well there are steps you can take to limit diminishing returns during your day. One sure fire way to save your willpower is to eliminate decision making in the first hour of your morning. 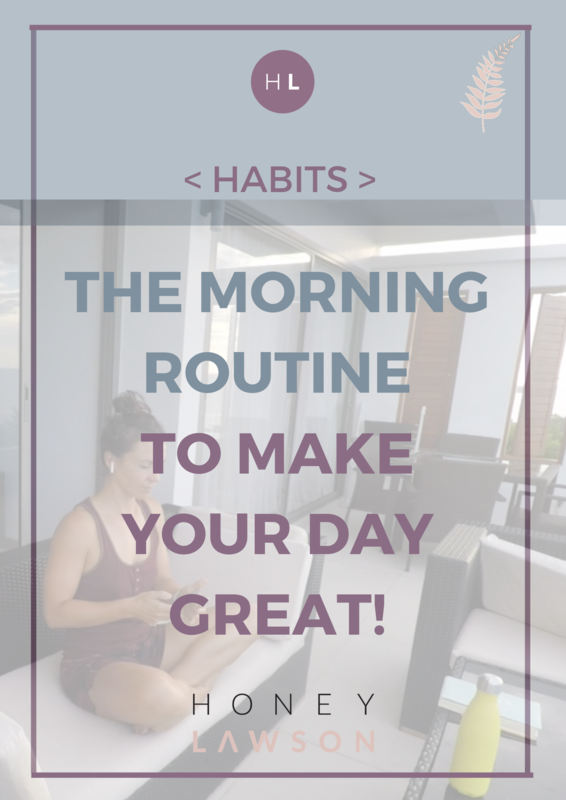 Instead of having to decide what to do, what to eat, what to wear etc, have a routine that is built out of habits. A habit doesn’t take as much brain power. We do it automatically. And if you want a really great day, make this routine conducive to a calmer mood, a clearer mind and an energised body. 1) Prepare your morning necessities the night before. Whatever the next 20 or 30 minutes consists of, make sure you have everything you need for it in one place. Try having a charging station outside of the bedroom (hello better sleep if you’re limiting blue light in the bedroom!). My morning necessities consist of my phone, my Air Pods, my 500ml water bottle already filled, and a journal and pen. 2) Get your body moving, gently. All that time lying down, possibly pretty motionless, and you want to just run right into your day? No thank you! Start with some decompression breathing. Deep breaths that fill your belly and your chest, breathing deep into the front and back will do the trick. Then try some spinal articulations. I love the Pilates Roll down. But my stretches often vary depending on how my body is feeling, and to keep it interesting! Again, you will have heard this all the time, but do you know why it is super beneficial? So you may have gone more than 6-8 hours without water. Considering how much of the body is water, it’s good to rehydrate yourself. BUT, did you know that water can help dilute the amino acids in the blood, and this is great for cellular regeneration (autophagy). Not only will you be in a fasted state, so lower amino acids already, but the water will further dilute your blood. This allows the body to go through its own cleaning process, getting rid of any damaged cells that we no longer need, and building new, stronger ones. Wahoo! 4) Are you yet to try mediation? Don’t like the thought of it maybe? How about we give it a different name? Grounding breathing? Quiet time? I find this really helps to quiet the chattering in my head before I have a full day of it! 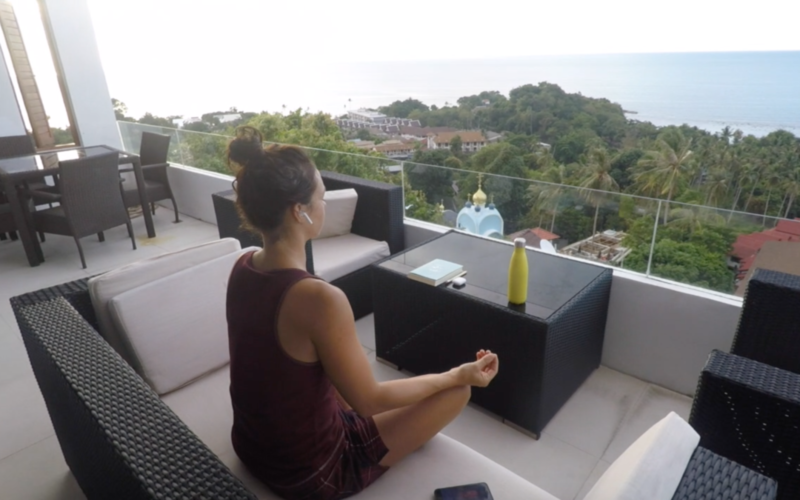 I use a guided mediation app, 1 Giant Mind, which helps me to focus, and I mostly do 10 minutes, but more when I have the time. 5) Finally, if you have another 5 minutes to spare, try journaling. When I first started doing this it would end up being a list of things to do for the day! But really, that can wait. Try writing whatever comes into your head. Maybe write about your meditation experience, or how your body was feeling when you stretched. Perhaps even write about your big goals and dreams, or your actual dreams that you had last night. This isn’t something you ever need to read again, but it can be a really helpful way of opening up your creative side first thing in the morning. These are just a few ways that I love to start my day. Yes it means getting up 30 minutes earlier, but I try to compensate by going to bed a little earlier, and my day is infinitely better for it. In an ideal world, I’ll then exercise straight away, followed by a delicious and nutritious breakfast. But that’s not always possible. I make these 5 steps my non negotiables, and everything else is a bonus. Are you going to try it? What might your morning routine consist of? Do you feel the difference between a day that you start like this, and a day where snooze has been pressed more times than you can remember and you’re rushing out the door with a piece of toast in hand? If you need a little more helping setting up a strong foundation of habits and routines, or feel like you’re not quite thriving, then get in touch for a FREE consultation call and we can see what small changes can be made to make a big difference.